A Changing World is the story of life in an English town and an English community as seen through the eyes of an ordinary English family – the author’s own. It focuses on the years from the 1930s through to the 1960s. From a familiar world in which life was simple and expectations modest, values were upheld and the community spirit prevailed, Britain was plunged into the chaos of war at a time when most people could all too clearly recall the horror of the preceding one. Never have the British people pulled together so strongly as they did in the war years, but with peacetime in the 1940s came unexpected challenges – economic strife, a slackening of social mores and moral codes and a new materialism. With these changes came new attitudes to work and its rewards which would greatly hamper our recovery. Terence Kearey’s portrait of an England responding to the pressure of rapid social and economic change has the authority of meticulous research – yet its intimate perspective renders it far more personal and vivid than any ordinary history book. 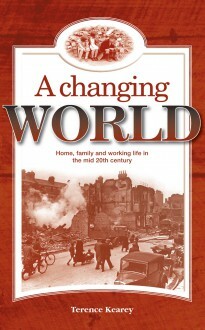 A Changing World is the third in a quartet of books by Terence Kearey dealing with aspects of life in Britain through the centuries from the perspective of his own family. The others are History, Heroism and Home, Country Ways and A Distance Travelled. The author is working on a screenplay based on the first three books and a definitive account of the Gommecourt Diversion discussed in History, Heroism and Home.